Fasinating, but not terribly useful to musicians: you’re limited to mono recording, since the mic is the recorder. Some interesting features, though: Mac/PC configuration of defaults, powered by AA batteries, single-button recording, USB connection, linear .WAV support. No word yet on pricing or availability. Now if they’ll just make a stereo mic version . . .
HHB comes highly recommended as a portable recording vendor, as a couple of you have tipped us off. 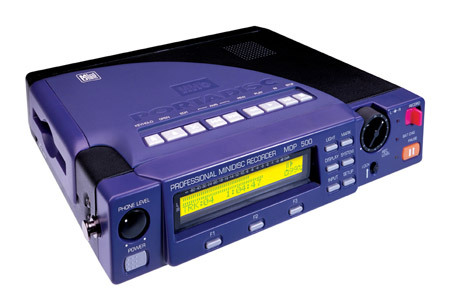 So if this mic-that’s-a-recorder seems too limited — or simply unnatural — look to HHB’s pro-grade portable recorders, the PortaDrive (hard drive recorder) and PortaDisc (MiniDisc recorder). This ain’t your Circuit City Sony MD, folks: think US$1500 for the HHB MDP500 (shown). But you’ll get a serious rival for a DAT recorder. For one of HHB’s main rivals, see the Fostex FR2, previously on CDM. We’ve now heard from readers happily using both the MDP500 and FR2 (read the comments on the link before if you haven’t already).